Certain cells in the eye contain a receptor protein known as rhodopsin that enables them to detect light. Rhodopsin is found in distinct patches on the membrane surrounding each of these “photoreceptor” cells and the number of rhodopsin molecules present controls how sensitive the cell is to light. In humans, vitamin A deficiency or genetic defects can decrease the number of rhodopsin molecules on the membrane, leading to difficulty in seeing in dim light. Fruit fly eyes also contain rhodopsin. Exposure to normal levels of light triggers parts of the membranes of fly photoreceptor cells to detach and move into the interior of the cell. These internalized pieces of membrane have two possible fates: they can either be destroyed or recycled back to the cell surface. This membrane turnover adjusts the size of the membrane surrounding the cell and the number of rhodopsin molecules in it to regulate the cell’s sensitivity to light. It is crucial that turnover is tightly regulated in order to maintain the integrity of the cell membrane. However, it is not clear how the process is regulated during light exposure. Thakur et al. set out to address this question in fruit flies. The experiments show that an enzyme called phospholipase D is activated when photoreceptors are exposed to light. Active phospholipase D – which generates a molecule called phosphatidic acid – coordinates the internalization of pieces of membrane with the recycling of rhodopsin back to the cell surface. Thakur et al. generated fly mutants that lacked phospholipase D and in these animals the internalized rhodopsin was not transported back to the cell membrane. This caused the membrane to shrink in size and decreased the number of rhodopsin molecules in it. As a result, the photoreceptor cells became less sensitive to light. The findings of Thakur et al. show that in response to normal levels of light, phospholipase D balances membrane internalization and recycling to maintain the size and rhodopsin composition of the membrane. Future challenges will be to work out exactly how phospholipase D is activated and how phosphatidic acid tunes membrane internalization and recycling. The ability to detect photons is a fundamental property of animal photoreceptors. In order to achieve this, ocular photoreceptors of animals generate an expanded region of plasma membrane that is packed with the receptor for light, rhodopsin. This strategy is used regardless of the architecture of the photoreceptor. For example, in ciliary photoreceptors (e.g vertebrate rods), light passes along the outer segment that is stacked with membranous discs, whereas in insect photoreceptors, the plasma membrane is expanded to form actin-based microvilli; both these structures are packed with rhodopsin, and incident light is absorbed as it passes along them (Arendt, 2003). The light-sensitive membranes of photoreceptors undergo stimulus-dependent turnover (LaVail, 1976; White and Lord, 1975); such turnover will alter both membrane area and composition, thus regulating sensitivity to light [reviewed in (Blest, 1988)]. The importance of this process is underscored by the human disease Best’s macular dystrophy, in which rod outer segment length and electroretinograms are altered during changes in ambient illumination, ultimately leading to macular degeneration (Abràmoff et al., 2013). Despite the importance of this process, the cellular and molecular mechanisms that regulate photosensitivemembrane turnover remains poorly understood. In Drosophila photoreceptors, the apical domain is expanded to form ca. 40,000 projections of light-sensitive plasma membrane (microvilli) that form the rhabdomere. Photons that are absorbed trigger G-protein-coupled phospholipase C (PLC) activity that culminates in the activation of the plasma membrane channels TRP and TRPL; the resulting Ca2+ influx triggers an electrical response to light (Hardie and Raghu, 2001). Additionally, photon absorption by rhodopsin1 (Rh1) also triggers the rhodopsin cycle [reviewed in (Raghu et al., 2012)]. Following photon absorption, Rh1 undergoes photoisomerization to meta-rhodopsin (M). M is phosphorylated at its C-terminus, binds β-arrestin and this complex is removed from the microvillar membrane via clathrin-dependent endocytosis to be either recycled back to the microvillar plasma membrane (Wang et al., 2014) or trafficked to the lysosomes for degradation (Chinchore et al., 2009) [reviewed in (Xiong and Bellen, 2013)]. Tight regulation of this process is critical for rhabdomere integrity during illumination as mutants defective in any of the several steps of the rhodopsin cycle undergo light-dependent collapse of the rhabdomere [reviewed in (Raghu et al., 2012)]. However, the process that couples endocytosis of rhabdomere membrane to plasma membrane recycling remains poorly understood. Phospholipase D (PLD) is an enzyme that hydrolyzes phosphatidylcholine (PC) to generate phosphatidic acid (PA). In yeast, loss of PLD (spo14) results in a sporulation defect, failure to synthesize PA (Rudge et al., 2001) and accumulation of undocked membrane vesicles on the spindle pole body (Nakanishi et al., 2006). The v-SNARE Spo20p binds PA in vitro (Nakanishi et al., 2004) and is required to dock Spo20p to target membranes; in this setting, PA generated by PLD appears to regulate a vesicular transport process. The potential role of PA in controlling vesicular transport also arose from observations in vitro that Arf proteins, key regulators of vesicular transport, stimulate mammalian PLD activity (Brown et al., 1993; Cockcroft et al., 1994). Overexpression of PLD1 in a range of neuronal (Cai et al., 2006; Vitale et al., 2001) and non-neuronal cells (Choi et al., 2002; Cockcroft et al., 2002; Huang et al., 2005) suggests that PLD can regulate vesicular transport. 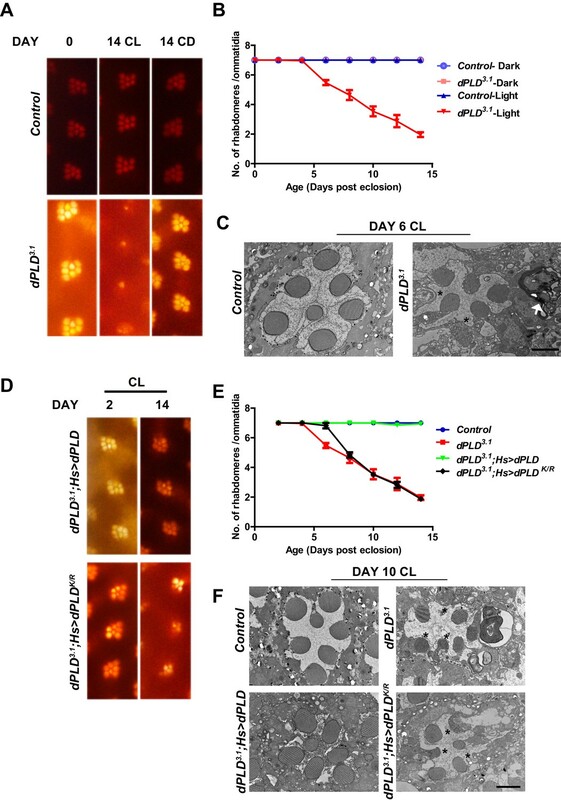 A previous study showed that elevated PA levels during development of Drosophila photoreceptors disrupts rhabdomere biogenesis with associated endomembrane defects (Raghu et al., 2009) that were Arf1-dependent. 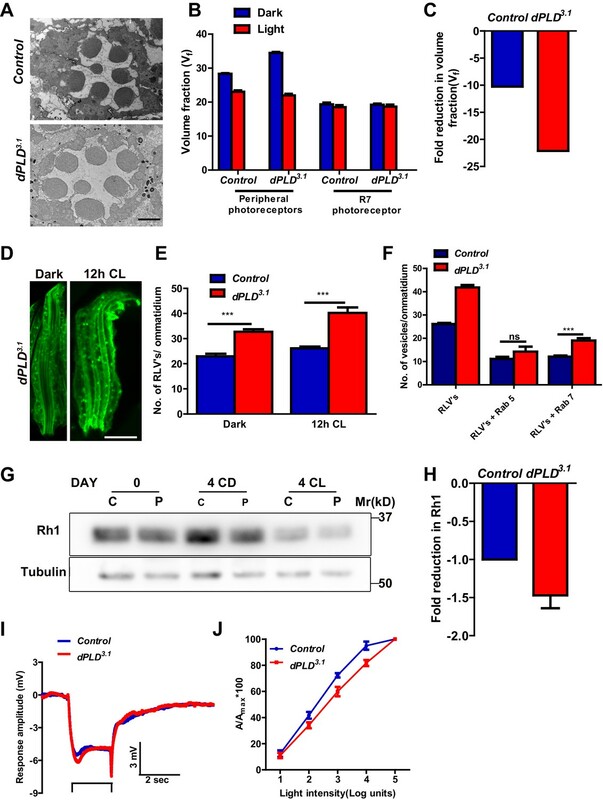 However, the mechanism underlying the role of PLD in regulating membrane transport has remained unclear, and to date, no study in metazoans has demonstrated a role, if any, for endogenous PLD in regulating vesicular transport in vivo. In this study, we show that during illumination in Drosophila photoreceptors, rhabdomere size is regulated through the turnover of apical plasma membrane via RLVs. 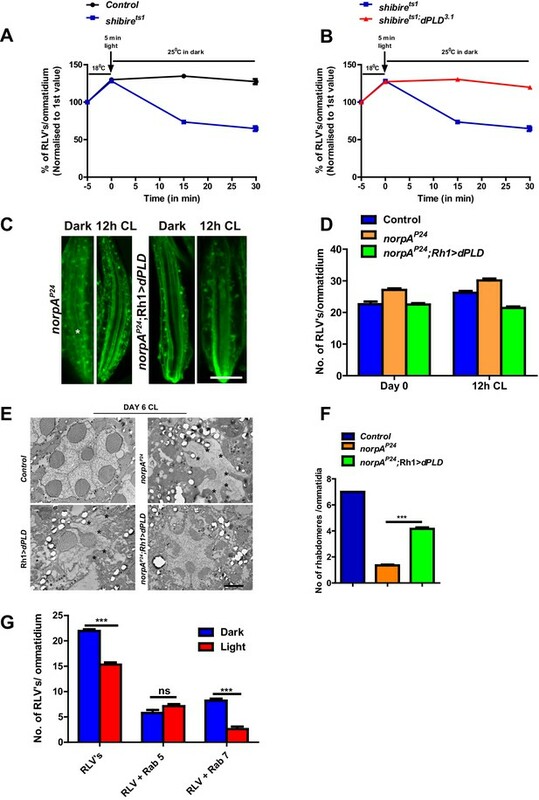 We find that photoreceptors have a light-regulated PLD activity that is required to maintain PA levels during illumination and support apical membrane size. PLD works in coordination with retromer function and Arf1 activity to regulate apical membrane size during illumination. Thus, PLD is a key regulator of plasma membrane turnover during receptor activation and signaling in photoreceptors. We quantified rhabdomere size of Drosophila photoreceptors during illumination by transmission electron microscopy (TEM) followed by volume fraction analysis. When wild-type flies are grown in white light for 48 hr (hrs) post-eclosion, the volume fraction (Vf) of the cell occupied by the rhabdomere in peripheral photoreceptors R1-R6 was reduced (Figure 1A,B). This reduction in Vf occurred prior to the onset of any obvious vesiculation or rhabdomere degeneration; the Vf of rhabdomere R7 that expresses UV-sensitive rhodopsin (that does not absorb white light) did not change (Figure 1A,B). This reduction in rhabdomere size was accompanied by changes in the localization of Rh1, the rhodopsin isoform expressed in R1-R6. With just 12 hr of illumination, there was an increase in the number of RLVs in the cell body (Figure 1C,D). A subset of these RLVs co-localize with the early and late endocytic compartment markers Rab5 and Rab7, respectively (Figure 1E,F). Over a period of 4 days, illumination results in a reduction in total Rh1 protein levels (Figure 1G) and manifests functionally as a reduction in sensitivity to light (Figure 1H). We generated loss-of-function mutants in dPLD using homologous recombination (Gong and Golic, 2003) (Figure 2—figure supplement 1A). Multiple alleles were isolated of which dPLD3.1 is described in detail. To test if dPLD3.1 represents an animal with no residual PLD activity, we used the transphosphatidylation assay that exploits the ability of PLD to use primary alcohols as nucleophilic acceptor. Flies were starved for 12 hr, allowed to feed for 6 hr on 10% ethanol/sucrose and the formation of phosphatidylethanol (PEth) was monitored using LC-MS (Wakelam et al., 2007). Under these conditions, multiple species of PEth were detected in wild-type flies, no PEth could be detected in dPLD3.1 extracts under the equivalent conditions (Figure 2—figure supplement 1C,D). Thus, dPLD3.1 mutants have no residual PLD activity. dPLD3.1 flies are homozygous viable as adults. At eclosion, photoreceptor ultrastructure in dPLD3.1 was indistinguishable from controls (Figure 2A). Following exposure to 2000 lux white light for 48 hr, as expected, Vf occupied by peripheral rhabdomeres was reduced in wild-type flies (Figure 2B), whereas Vf of R7 was unaffected. In dPLD3.1, rhabdomere Vf reduced following illumination (Figure 2B); however, the reduction was substantially greater than in wild type (Figure 2C). We visualized RLVs in photoreceptors by Rh1 immunolabeling and counted them. These analyses were done at 0 days post-eclosion, prior to the onset of any obvious ultrastructural change in dPLD3.1. In dark-reared flies, the number of RLVs in dPLD3.1 was greater than in wild-type photoreceptors (Figure 2D,E). Following illumination for 12 hr, the number of RLVs increases in both controls and dPLD3.1; however, the increase was greater in dPLD3.1 (Figure 2E). Further, while the number of RLVs that were Rab5-positive was not significantly different between controls and dPLD3.1, the number of Rab7-positive RLVs were significantly greater in dPLD3.1 compared to controls (Figure 2F). Thus, during illumination there is enhanced accumulation of RLVs in a Rab7 positive compartment in dPLD3.1. We measured Rh1 protein levels using Western blotting in flies exposed to bright illumination for four days post-eclosion. As expected, levels of Rh1 decreased when wild-type flies were reared in bright light compared to dark-reared controls (Figure 2G). In dark reared flies, Rh1 levels are equivalent in controls and dPLD3.1 (Figure 2G); following illumination Rh1 levels decrease in both genotypes but the reduction seen in dPLD3.1 is much greater than in wild-type flies of matched eye color (Figure 2G,H). Consistent with this, we found that dPLD3.1 photoreceptors were less sensitive to light compared to controls of matched eye color on eclosion (Figure 2J). These findings demonstrate that during illumination, the turnover of Rh1, an apical membrane protein of photoreceptors is altered in dPLD3.1. However, such changes were not seen in the levels or localization of TRP and NORPA, two other apical membrane proteins, during illumination (Figure 2—figure supplement 2A,B). dPLD3.1 photoreceptors did not exhibit a primary defect in the electrical response to light in electroretinograms (Figure 2I, Figure 2—figure supplement 3 A-D). We grew flies in constant illumination following eclosion. Under these conditions, control photoreceptors maintain normal structure; however, dPLD3.1 undergoes light-dependent retinal degeneration. The degeneration starts by day 5 post-eclosion and all six peripheral photoreceptors degenerate by day 14 (Figure 3A,B). This degeneration is strictly dependent on illumination as dPLD3.1 not exposed to light retains normal ultrastructure up to day 14 (Figure 3A,B). Photoreceptor degeneration is underpinned by a collapse of the apical microvillar membrane as well as the accumulation of membranous whorls within the cell body (Figure 3C). Retinal degeneration was also seen in a trans-heterozygote combination of two independently isolated alleles dPLD3.1 and dPLD3.3 (Figure 3—figure supplement 1A, B). No degeneration was seen in either dPLD3.1/+ or dPLD3.3/+ (Figure 3—figure supplement 1A) excluding a dominant negative or neomorphic effect of these alleles. The light-dependent degeneration was also seen when the dPLD3.1 allele was placed over a deficiency chromosome for the dPLD gene region; in dPLD3.1/Df(2R)ED1612, retinal degeneration was comparable and was no worse than in dPLD3.1 homozygotes (Figure 3—figure supplement 1C), suggesting that dPLD3.1 is a null allele. Light-dependent degeneration in dPLD3.1could be rescued by a wild-type transgene [dPLD3.1;Hs>dPLD] but not by a lipase dead transgene [dPLD3.1;Hs>dPLDK/R] (Figure 3D,E,F). These results demonstrate that dPLD enzyme activity is required to support normal photoreceptor ultrastructure during illumination. In order to understand the biochemical basis of retinal degeneration of dPLD3.1, we measured levels of PC and PA from retinal extracts using direct infusion mass spectrometry (Schwudke et al., 2011). We found that levels of PC were not significantly different between controls and dPLD3.1 (Figure 4A). By contrast, there was a significant decrease in total PA levels in dPLD3.1 (Figure 4B). At the level of molecular species, this reduction was associated with changes in the levels of PA species with longer acyl chain lengths (Figure 4C). Rescue of retinal degeneration in dPLD3.1 by reconstitution with Hs>dPLD was associated with restoration in PA levels back to that of controls (Figure 4D). Reconstitution with Hs>dPLDK/R that failed to rescue degeneration also did not restore PA levels in dPLD3.1 (Figure 4D). These results show that retinal degeneration in dPLD3.1 is correlated with reduced PA levels. We hypothesized that if the retinal degeneration in dPLD3.1 is due to reduced PA levels, elevating PA levels in dPLD3.1 retinae by methods independent of dPLD activity should rescue this phenotype. It is reported that in laza22 photoreceptors, lacking Type II PA phosphatase activity, PA levels rise during exposure to light (Garcia-Murillas et al., 2006). We generated double mutants dPLD3.1;laza22 and studied retinal degeneration in these flies. We found that dPLD3.1;laza22 photoreceptors did not undergo light dependent-degeneration (Figure 4E). To test if this was due to restoration of PA levels, we measured PA levels in all these genotypes. As previously reported, we found that PA levels were elevated in laza22; importantly, the reduced levels of PA seen in dPLD3.1 was restored in dPLD3.1;laza22 (Figure 4F). We also overexpressed rdgA, encoding the major diacylglycerol kinase (DGK) activity in photoreceptors. Overexpression of rdgA has previously been shown to elevate PA levels without affecting retinal ultrastructure (Raghu et al., 2009). When rdgA is overexpressed in dPLD3.1 (dPLD3.1;Rh1>rdgA), retinal degeneration was completely rescued and the reduced PA levels seen in dPLD3.1 were reverted back to wild type levels (Figure 4—figure supplement 1A,B). Collectively, these observations suggest that reduced PA levels underlie the retinal degeneration phenotype of dPLD3.1. The finding that dPLD3.1undergoes light-dependent retinal degeneration suggests that dPLD might be activated during illumination. When Drosophila photoreceptors are illuminated, a key source of PA is the sequential activity of PLCβ and DGK (Inoue et al., 1989; Yoshioka et al., 1983) and PA is also metabolized by the PA phosphatase laza (Garcia-Murillas et al., 2006). In order to uncover a potential dPLD generated pool of PA, we exploited dGq1 mutants in which the failure to activate PLCβ results in a suppression of PA production via DGK (Garcia-Murillas et al., 2006). We compared PA levels in retinal extracts from dGq1with dGq1,dPLD3.1 both in the dark and following illumination with 12 hr of light. PA levels from both genotypes were comparable in dark reared flies; however, PA levels rise in dGq1mutants following illumination presumably reflecting production from a non-PLCβ-DGK source (Figure 4G). This rise in PA levels was suppressed in dGq1, dPLD3.1 flies (Figure 4G). Thus, illumination induces dPLD dependent PA production in Drosophila photoreceptors. dPLD was overexpressed in adult photoreceptors (Rh1>dPLD). Following 12 hr of white light illumination, the number of RLVs increases in the cell body of wild type (Figure 4H,I). However, in Rh1>dPLD the number of RLVs did not increase (Figure 4H,I); this effect was not seen on overexpression of Rh1>dPLDK/R (Figure 4H,I) suggesting that the ability of dPLD to regulate RLV turnover is dependent on its catalytic activity. Together, these observations suggest that during illumination dPLD activity can support RLVs turnover. RLV numbers in the cell body are an outcome of the balance between ongoing clathrin- dependent endocytosis of Rh1 containing rhabdomere membrane as well as mechanisms that remove these from the cell body. To understand the mechanism underlying the increased RLV number in dPLD3.1, we exploited the temperature-sensitive allele of dynamin, shits1. At the permissive temperature of 18°C, where dynamin function is normal, we exposed flies to a 5-min pulse of bright white light to trigger Rh1 isomerization to M and trigger its endocytosis. Under these conditions, the number of RLVs generated in cells with and without PLD function was indistinguishable (Figure 5A,B). Following this, animals were rapidly shifted to 25°C, incubated for various time periods, retinae were fixed, processed and RLVs counted. Under these conditions, in shits1, where there is no further ongoing endocytosis, RLV numbers fall rapidly, presumably reflecting the removal of previously endocytosed vesicles (Figure 5A). By contrast, in shits1;dPLD3.1, following the shift to 25°C post-illumination, there was no drop in RLV number with time implying a defect in mechanisms that remove RLVs from the cell body (Figure 5B). We counted RLVs in norpAP24 subjected to bright illumination; as previously reported, we found RLV numbers were elevated (Chinchore et al., 2009). This elevation in RLV number could be suppressed by the overexpression of dPLD (Figure 5C,D). We also found that the light-dependent retinal degeneration in norpAP24 that is reported to depend on RLV accumulation in a Rab7 compartment (Chinchore et al., 2009) (Wang et al., 2014) could be partially suppressed by overexpressing dPLD (Figure 5E,F). Interestingly, we found that during illumination, in Rh1>dPLD, there was a significant reduction in the number of Rab7-positive RLVs but not in the number of Rab5-positive RLVs (Figure 5G). Collectively, these findings show that dPLD supports a process that can clear RLVs from the cell body of photoreceptors during illumination. The retromer complex plays a central role in removing endocytosed transmembrane proteins from the lysosomal pathway and targets them to other cellular compartments (Gallon and Cullen, 2015). We tested the effect of manipulating core members of the retromer complex in photoreceptors. RNAi downregulation of vps35 results in an increase in RLV numbers both in the dark and following 12 hr illumination (Figure 6A,B). We tested the effect of overexpressing vps35 in photoreceptors during illumination; in an otherwise wild-type fly, this did not result in changes in RLV number (Figure 6D) or caused retinal degeneration (Figure 6C). However, in dPLD3.1 photoreceptors, overexpression of vps35 results in two key outcomes: (i) the increased numbers of RLVs seen in dPLD3.1 are reduced back to wild type levels (Figure 6D) and (ii) the retinal degeneration of dPLD3.1 is suppressed (Figure 6C). During illumination, overexpression of dPLD results in a reduction of RLV number in a lipase-dependent manner (Figure 4H,I). We tested the requirement of intact retromer function for the ability of dPLD to clear RLVs. We found that in cells where vps35 was downregulated, overexpression of dPLD could not reduce RLV numbers (Figure 6E,F). These findings suggest that intact retromer function is required for dPLD to support the clearance of RLVs during illumination. We overexpressed garz, the Drosophila ortholog of the guanine nucleotide exchange factor (GBF1) of Arf1 (Cox et al., 2004). In adult photoreceptors, garz overexpression does not impact rhabdomere structure during illumination (Figure 7B,C), although RLV numbers were reduced (Figure 7A). When garz is overexpressed in dPLD3.1, it completely rescues retinal degeneration (Figure 7B,C). These findings strongly suggest that retinal degeneration in dPLD3.1 may be due to reduced ARF1 activity. If this model is true then reducing garz activity in wild-type flies should phenocopy dPLD3.1. To test this, we down-regulated garz in photoreceptors; this resulted in light-dependent retinal degeneration, the kinetics of which were comparable to that of dPLD3.1 (Figure 7D,E). Finally, we found that overexpression of garz reduced RLV number in dPLD3.1 back toward wild-type controls (Figure 7F). Since both garz and dPLD play a role in RLV clearance during illumination (Figure 7 and Figure 4), we tested the requirement of each molecule on the other for this function. We found that the ability of Rh1>dPLD to clear RLVs required intact garz function. When garz is also depleted (Rh1>garzRNAi) in Rh1>dPLD cells, the reduction in RLV number seen in Rh1>dPLD alone was attenuated (Figure 8A). This finding suggests that a garz-dependent step is required to support RLV clearance by dPLD during illumination. We also explored the route by which garz activity clears RLVs. When Rh1>garz is performed in photoreceptors where retromer function is depleted (Rh1>vps35RNAi), the reduction in RLV number seen in Rh1>garz alone is substantially blocked (Figure 8B). Thus, the ability of garz to support RLV clearance from the cell body requires intact retromer function. Since our observations indicate a role of dPLD and its product PA in the context of Arf1-GTP activity, we tested the requirement for dPLD in regulating the biological activity of Arf1. In photoreceptors, overexpression of constitutively active Arf1, Arf1CA (Rh1>Arf1CA), results in ultrastructure defects in the rhabdomere (Figure 8C). We expressed Rh1>Arf1CA in dPLD3.1 and studied its effect on ultrastructure. In the absence of dPLD function, the effect of Rh1>Arf1CA on ultrastructure was substantially reduced (Figure 8C iii versus iv). 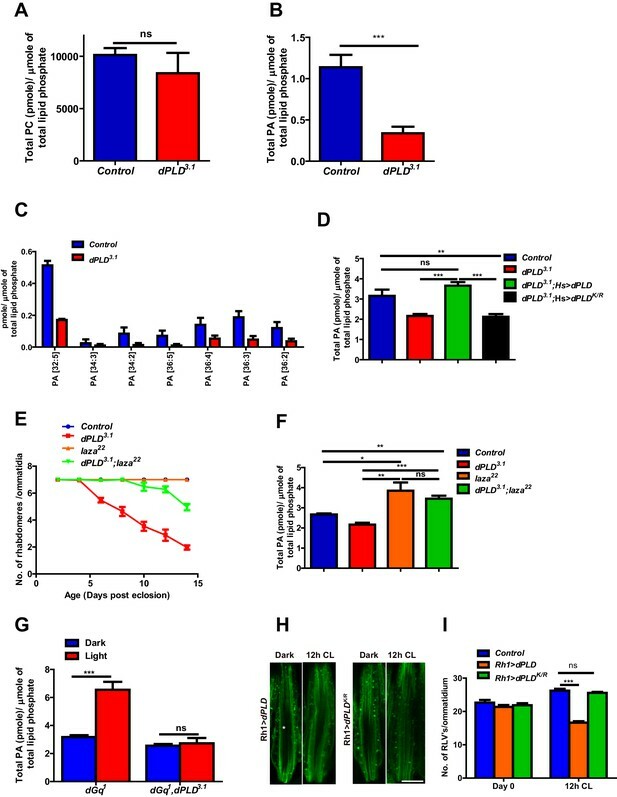 This finding suggests that PA produced by dPLD is required to mediate the effects of Arf1 in vivo. Although the importance of plasma membrane turnover in determining cellular responses to external stimuli is well appreciated, the mechanisms that regulate this process remain unclear. In photoreceptors, change in size of photosensitive membranes during illumination represents a special example of the broad principle of plasma membrane turnover following receptor-ligand interaction. In dPLD3.1 photoreceptors, the process of light-induced membrane turnover is exaggerated; these photoreceptors show larger reductions in rhabdomere volume and greater reductions in Rh1 levels than is seen in wild-type flies. The physiological consequence of this is that dPLD3.1 photoreceptors are less sensitive to light than controls when reared in light (Figure 2J). During illumination, RLVs are generated and mature through Rab5 and Rab7 endocytic compartments. We found that (i) photoreceptors contain a light-stimulated PLD activity, (ii) Loss of dPLD activity results in enhanced numbers of Rab7-positive RLVs in the cell body during illumination, (iii) overexpression of catalytically active dPLD was able to clear light-induced Rab7-positive RLVs in wild-type cells and (iv) dPLD overexpression was able to reduce the enhanced RLV number and partially suppress retinal degeneration in norpAP24, a mutant that shows enhanced Rab7 positive RLVs during illumination. Thus ,dPLD represents an enzyme activity that couples the generation of RLVs by light-induced endocytosis to their removal from the cell body. It has previously been reported that the Rh1 that accumulates in Rab7 compartment is targeted for degradation, thus leading to retinal degeneration (Chinchore et al., 2009). Accumulation of Rh1 in Rab7-positive endosomes may explain the progressive microvillar collapse and reduced Rh1 protein levels in the cell body of dPLD3.1. Both, the microvillar degeneration and reduced PA levels of dPLD3.1 retinae were rescued by a dPLD transgene with intact lipase activity and elevation of PA levels was sufficient to rescue this phenotype. Collectively, our observations strongly suggest that photoreceptors depend on a light-activated dPLD to generate PA to maintain apical membrane turnover during illumination. They also suggest that protein-protein interactions of PLD, independent of its catalytic activity, may not be a primary mechanism underlying the function of this enzyme in cells. In principle, the number of RLVs seen in a photoreceptor following illumination is a balance between ongoing endocytosis and processes that remove endocytosed RLVs either by recycling to the microvillar membrane or targeting to the late endosome-lysosome system for degradation. 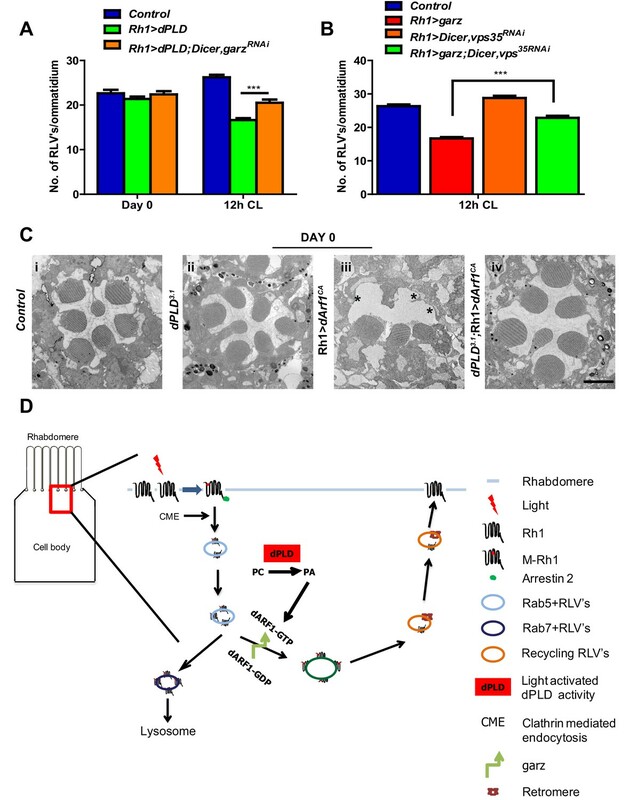 Using the temperature-sensitive allele of dynamin shits1, we were able to uncouple RLV endocytosis from their removal from the cell body and found that the generation of RLVs during illumination was not dependent on dPLD activity (Figure 5I) and the number of Rab5-positive RLVs was not increased in dPLD3.1 photoreceptors (Figure 2F). Collectively, these observations suggest no primary defect in clathrin dependent endocytosis in dPLD3.1. However, we found that in dPLD3.1, the clearance of endocytosed RLVs was dramatically slower than in controls implying that dPLD supports a process that clears RLVs from the cell body. These RLVs were Rab7-positive suggesting that they accumulate in late endosomes. Conversely, in Rh1>dPLD, the number of Rab7-positive RLVs was fewer than in wild-type cells. Together, these observations strongly suggest that dPLD activity supports a process that clears RLVs post endocytosis. Following endocytosis, endosomes containing trans-membrane proteins (such as Rh1) can be targeted for lysosomal degradation or be retrieved for recycling to other membranes through retromer-dependent processes. The enhanced RLV numbers as well as retinal degeneration in dPLD3.1 could be rescued by enhancing retromer activity and the ability of dPLD overexpression to reduce RLV number during illumination required intact retromer activity. Together, these observations suggest that during illumination dPLD stimulates RLV clearance through a retromer-dependent mechanism. We found enhanced number of Rab7-positive RLVs in dPLD3.1 and Rh1>dPLD had reduced number of Rab7-positive RLVs. A previous study has reported that retromer activity can clear RLVs from a Rab7-positive compartment (Wang et al., 2014). Together, our findings suggest that in the absence of dPLD the sorting of RLVs away from Rab7 endosomes into retromer-dependent recycling is inefficient. Why might cargo sorting in dPLD3.1 be abnormal ? Sorting reactions in vesicular transport often involve a small GTPase working in conjunction with a lipid-metabolizing enzyme. 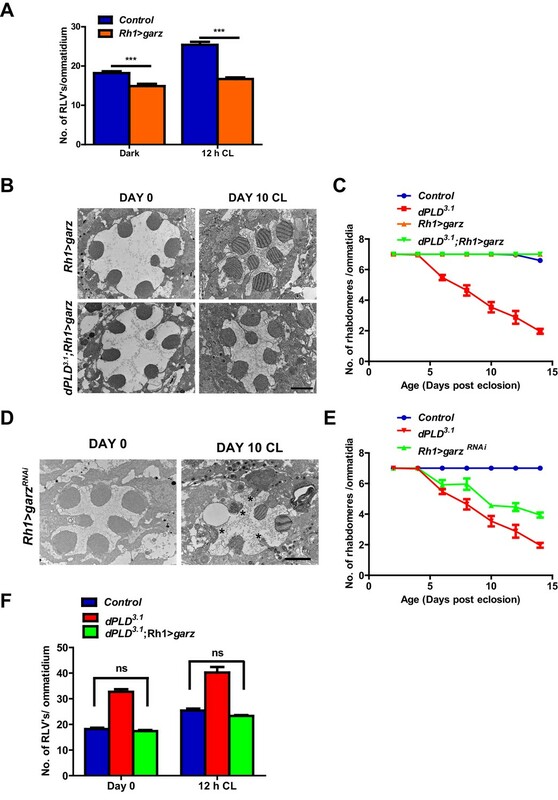 Altering garz function, presumably altering Arf1-GTP levels, has three consequences: (i) in wild-type cells, enhancing garz levels results in fewer RLVs and blocks the rise in RLVs seen during light exposure. (ii) enhancing garz levels reduces RLV accumulation in dPLD3.1 (iii) enhancing garz levels suppresses degeneration in dPLD3.1 while depleting garz in wild-type flies results in light-dependent retinal degeneration with a time course similar to that seen in dPLD3.1. Thus, an Arf1-GTP dependent step is required for both RLV turnover and maintaining apical domain size in photoreceptors. Our finding that the ability of Rh1>dPLD to modulate RLV number requires intact garz function (Figure 8A) is consistent with this model. These findings imply that Arf1-GTP levels positively regulate a step that enhances RLV recycling to the microvillar plasma membrane in the face of ongoing light-induced endocytosis, presumably through retromer complex activity. In support of this idea, we found that the ability of Rh1>garz to reduce RLV numbers during illumination depends on intact retromer function (Figure 8B). We propose, that during illumination, rhabdomere size is maintained by the balance between clathrin-dependent endocytosis generating RLVs and an Arf1-GTP dependent sorting event that recycles RLVs to the plasma membrane via retromer activity (Figure 8D). dPLD, specifically its product PA is likely able to balance these two reactions by coupling light-induced endocytosis to Arf1-dependent sorting of RLVs into the recycling pathway. Previous studies have identified proteins from brain cytosol that bind PA in vitro and are known to regulate membrane transport events; prominent among these was Arf1 (Manifava et al., 2001) although the in vivo significance of this binding is unknown. Our findings that the biological activity of Arf1CA in photoreceptors requires intact dPLD activity and that the ability of increased garz (Arf1-GEF) levels to clear RLVs requires intact dPLD function suggests that Arf1 is a key target of PA generated by dPLD in mediating sorting and recycling of RLVs in photoreceptors. It has been reported that EHD1 an ATPase required to generate tubular recycling endosomes is recruited by MICAL-L1 and the BAR domain protein syndapin2 both of which bind PA (Giridharan et al., 2013). It is possible that these proteins are also targets of PA generated by dPLD. In the absence of PA, RLV sorting into the recycling pathway is impaired in dPLD3.1, some fraction of the endocytosed RLVs accumulates in Rab7 endosomes and is targeted for degradation leading to the reduction in Rh1 levels. These reduced Rh1 levels likely account for the reduced light sensitivity of dPLD mutants reported both in this study as well as in a previous analysis (LaLonde et al., 2005). What is the transduction pathway between photon absorption and dPLD activation? 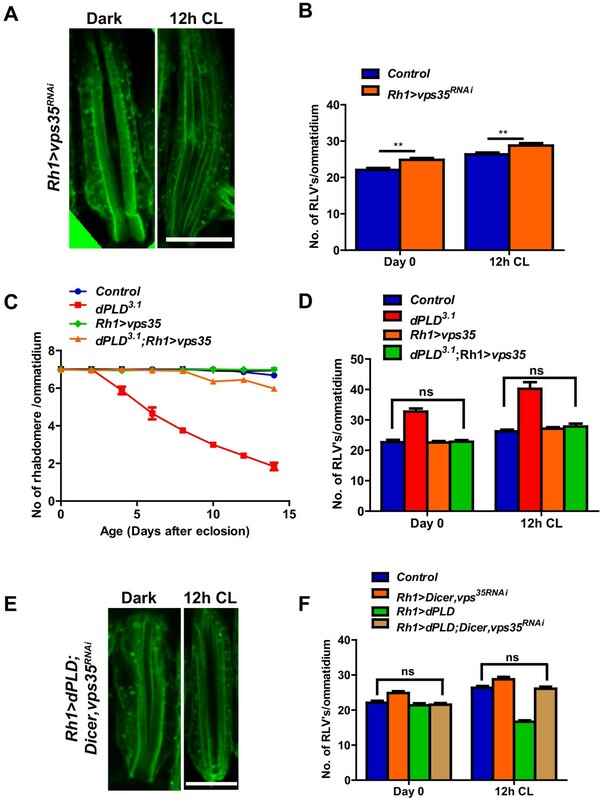 dPLD3.1 photoreceptors show normal electrical responses to light and the microvillar degeneration of dPLD3.1 could not be suppressed by a strong hypmorph of dGq (Scott et al., 1995) that is required for PLCβ dependent phototransduction. We also found that light-activated elevation of PA levels was dependent on dPLD activity but did not require Gq-PLCβ signalling. 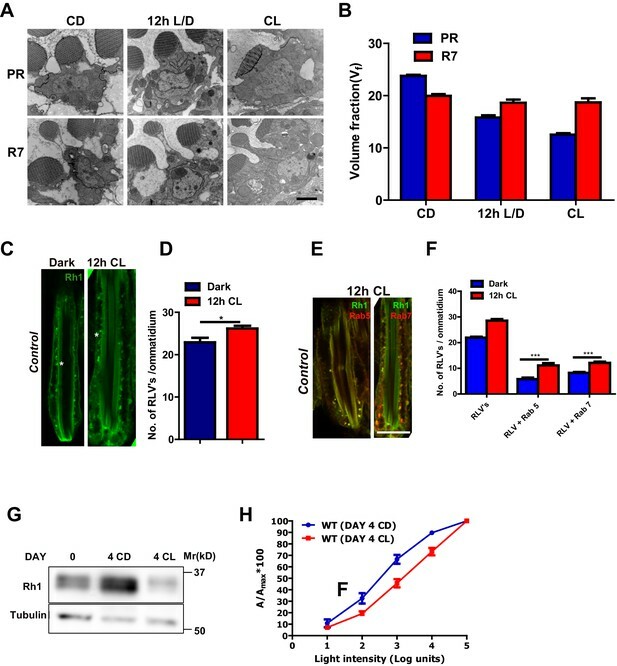 Collectively, these findings imply that dPLD activity is dispensable for Gq-PLCβ mediated activation of TRP channels and that the light-dependent degeneration of dPLD3.1 is not a consequence of abnormal TRP channel activation. Our findings suggest that M activates dPLD without the requirement of Gq function, although the molecular mechanism remains to be determined. dPLD has been reported to be localized in the submicrovillar cisternae (LaLonde et al., 2005; Raghu et al., 2009), a specialization of the smooth endoplasmic reticulum that is positioned ca. 10 nm from the plasma membrane at the base of the microvilli (Yadav et al., 2016). At this location, dPLD might bind to the C-terminal tail of M either before or after it is endocytosed into RLV; binding of mammalian PLD1 has been reported to the C-terminal tail of several rhodopsin superfamily GPCRs including the 5-HT2a, muscarinic and opioid receptors [(Barclay et al., 2011) and references therein]. It is possible that PA produced by dPLD bound to the C-terminus of Rh1 may then stimulate recycling to the apical membrane. Thus, the control of apical membrane turn over by dPLD during illumination may represent an example by which ligand bound GPCRs signal without a direct involvement for heterotrimeric G-protein activity. More generally in the brain,neurons and glial cells express GPCRs (5-HT2a, mGluR and opioid receptors) of key functional importance. Controlling these GPCR numbers on the plasma membrane during receptor stimulation (of which rhodopsin turnover during illumination is a prototypical example) is of critical importance to brain function and mechanisms that regulate this process will likely be crucial for the understanding and treatment of neuropsychiatric syndromes. Flies were reared on medium containing corn flour, sugar, yeast powder and agar along with antibacterial and antifungal agents. Flies were maintained at 25°C and 50% relative humidity. There was no internal illumination within the incubator, and the flies were subjected to light pulses of short duration only when the incubator door was opened. When required, flies were grown in an incubator with constant illumination from a white light source (intensity ~2000 lux). The wild type used for all experiments was Red Oregon-R. GAL4-UAS system was used to drive expression of transgenic constructs. The following transgenic lines were obtained from the Bloomington Stock Center: UAS-GFP::Rab5 (B#43336),UAS-YFP::Rab7 (B#23270). UAS-garzRNAi (V# 42140) was obtained from the Vienna Drosophila RNAi Center. Dicer;UAS-vps35RNAi was obtained from Miklós Sass ( Eötvös Loránd University, Budapest, Hungary) and UAS-vps35::HA was obtained from Prof. Hugo Bellen (Baylor College of Medicine, Howard Hughes Medical Institute, Houston). Flies were cooled on ice, decapitated using a sharp blade, and fixed on a glass slide using a drop of colorless nail varnish. Imaging was done using 40X oil objective of Olympus BX43 microscope. In order to obtain a quantitative index of degeneration, atleast five flies were scored for each time point. A total of 50 ommatidia were assessed to generate degeneration index. To quantify degeneration, a score of one was assigned to each rhabdomere that appeared to be wild type. Thus, wild-type ommatidia will have a score of 7. Mutants undergoing degeneration will have a score between 1 and 7. Score were expressed as mean ± SEM. Flies were anesthetized on ice and immobilized at the end of a disposable pipette tip using a drop of nail varnish. The recording electrode (GC 100 F-10 borosilicate glass capillaries, 1 mm O.D and 0.58 mm I.D from Harvard apparatus filled with 0.8% w/v NaCl solution) was placed on the surface of eye and the reference electrode was placed on the neck region/thorax. Flies were dark adapted for 5 min followed by ten repeated green light flashes of 2 s duration, each after an interval of 10 s. Stimulating light was delivered from a LED light source placed within a distance of 5 mm of the fly's eye through a fiber optic guide. Calibrated neutral density filters were used to vary the intensity of the light over five log units. Voltage changes were amplified using a DAM50 amplifier (WPI) and recorded using pCLAMP 10.2. Analysis of traces was performed using Clampfit (Axon Laboratories). Heads from 1-day-old flies (unless otherwise specified) were decapitated in 2X SDS-PAGE sample buffer followed by boiling at 95°C for 5 min. For detection of rhodopsin, samples were incubated at 37°C for 30 min and then subjected to SDS-PAGE and western blotting. The following antibodies were used: anti-rhodopsin (1:250-4C5), anti-α-tubulin (1:4000,E7c), anti-TRP (1:4000) and anti-NORPA (1:1000). All secondary antibodies (Jackson Immunochemicals) were used at 1:10000 dilution. Quantification of the blot was done using Image J software from NIH (Bethesda, MD, USA). For immunofluorescence studies retinae from flies were dissected under low red light in phosphate buffer saline (PBS). Retinae were fixed in 4% paraformaldehyde in PBS with 1 mg/ml saponin at room temperature for 30 min. Fixed eyes were washed three times in PBST (1X PBS + 0.3% TritonX-100) for 10 min. The sample was then blocked in a blocking solution (5% Fetal Bovine Serum in PBST) for 2 hr at room temperature, after which the sample was incubated with primary antibody in blocking solution overnight at 4°C on a shaker. The following antibodies were used: anti-Rh1 (1:50),anti-TRP (1:250) and anti-GFP (1:5000,abcam [ab13970]). Appropriate secondary antibodies conjugated with a fluorophore were used at 1:300 dilutions [Alexa Fluor 488/568/633 IgG, (Molecular Probes)] and incubated for 4 hr at room temperature. Wherever required, during the incubation with secondary antibody, Alexa Fluor 568-phalloidin (Invitrogen) was also added to the tissues to stain the F-actin. After three washes in PBST, sample was mounted in 70% glycerol in 1X PBS. Whole mounted preps were imaged on Olympus FV1000 confocal microscope using Plan-Apochromat 60x,NA 1.4 objective (Olympus). Whole mount preparations of photoreceptors stained with anti-Rh1 were imaged on Olympus FV1000 confocal microscope using Plan-Apochromat 60X, NA 1.4 objective (Olympus). The RLV’s per ommatidium were counted manually across the Z-stacks using Image J software from NIH (Bethesda, MD, USA). Samples for TEM were prepared as mentioned in previous publication (Garcia-Murillas et al., 2006). Briefly samples were bisected in ice cold fixative solution (For 1 ml: 0.5 ml of 0.2 M PIPES (pH:7.4),80 µl of 25% EM grade glutaraldehyde, 10 µl of 30% H2O2 and 0.41 ml water). After over-night fixation at 4°C, samples were washed in 0.1M PIPES (thrice 10 min. each) and then fixed in 1% osmium tetroxide (15 mg Potassium Ferrocyanide, 500 µl 0.2M PIPES, 250 µl 4% Osmium tetroxide and 250 µl of distilled water) for 30 min. The eyes were then washed with 0.1M PIPES (thrice 10 min. each) and then stained in en-block (2% Uranyl acetate) for 1 hr. Eyes were dehydrated in ethanol series and embedded in epoxy. Ultrathin sections (60 nm) were cut and imaged on a Tecnai G2 Spirit Bio-TWIN (FEI) electron microscope. Volume fractions were calculated separately for R1–R6 and R7. TEM images were acquired using Tecnai G2 Spirit Bio-TWIN (FEI) electron microscope. To quantify degeneration, a score of one was assigned to each rhabdomere that appeared to be wild type and a score of 0.5 was assigned to each rhabdomere that appeared to be partially degenerated. Pure preparations of retinal tissue were collected using previously described methods (Fujita et al., 1987). Briefly, 0- to 12-hr-old flies (unless otherwise specified) were snap frozen in liquid nitrogen and dehydrated in acetone at −80°C for 48 hr. The acetone was then drained off and the retinae dried at room temperature. They were cleanly separated from the head at the level of the basement membrane using a scalpel blade. Ten heads or 100 retinae per sample (dissected from 1-day-old flies) were homogenized in 0.1 ml methanol containing internal standards) using an automated homogenizer. The methanolic homogenate was transferred into a screw-capped tube. Further methanol (0.3 ml) was used to wash the homogenizer and was combined in the special tube. 0.8 ml chloroform was added and left to stand for 15 min. 0.88% KCl (0.4 ml) was added to split the phases. The lower organic phase containing the lipids were dried, re-suspended in 400 µl of chloroform:methanol 1:2 and was ready for analysis. Total lipid phosphate was quantified from each extract prior to infusion into the mass spectrometer. Mass spectrometer analyses were performed on a LTQ Orbitrap XL instrument (Thermo Fisher Scientific) using direct infusion method. Stable ESI-based ionization of glycerophospholipids was achieved using a robotic nanoflow ion source TriVersa NanoMate (Advion BioSciences) using chips with the diameter of spraying nozzles of 4.1 μm. The ion source was controlled by Chipsoft 8.3.1 software. Ionization voltages were +1.2 kV and −1.2 kV in positive and negative modes, respectively; back pressure was set at 0.95 psi in both modes. The temperature of ion transfer capillary was 180°C. Acquisitions were performed at the mass resolution Rm/z400 = 100,000. Dried total lipid extracts were re‐dissolved in 400 μl of chloroform:methanol 1:2. For the analysis, 60 μl of samples were loaded onto 96‐well plate (Eppendorf) of the TriVersa NanoMate ion source and sealed with aluminum foil. Each sample was analyzed for 20 min in positive ion mode where PC was detected and quantified. This was followed by an independent acquisition in negative ion mode for 20 min where PA was detected and quantified. Lipids were identified by LipidXplorer software by matching m/z of their monoisotopic peaks to the corresponding elemental composition constraints. Molecular Fragmentation Query Language (MFQL) queries compiled for all the aforementioned lipid classes. Mass tolerance was 5 p.p.m. and intensity threshold was set according to the noise level reported by Xcalibur software (Thermo Scientific). One-day-old flies were starved for 12 hr and then fed on 10% ethanol in sucrose for 6 hr. Following this lipids were extracted (with appropriate internal standards) and phosphatidylethanols detected and quantified by HPLC/MS method (Wakelam et al., 2007). Data were tested for statistics using unpaired t-test. *** denotes p<0.001; ** denotes p<0.01; * denotes p<0.05 and ns denotes not significant. Investigative Opthalmology & Visual Science 54:3721–3728. In: P Evans, V Wigglesworth, editors. Advances in Insect Physiology. Academic Press. pp. 1–53. The Journal of Immunology 168:5682–5689. Molecular Biology of the Cell 15:1487–1505. Molecular Biology of the Cell 24:1776–1790. Molecular Biology of the Cell 16:2614–2623. The Journal of Biological Chemistry 264:5996–6000. The Journal of Cell Biology 169:471–479. Journal of Biological Chemistry 276:8987–8994. Molecular Biology of the Cell 15:1802–1815. Journal of Cell Science 119:1406–1415. The Journal of Cell Biology 185:129–145. Biochimica Et Biophysica Acta (BBA) - Molecular and Cell Biology of Lipids 1821:1154–1165. Cold Spring Harbor Perspectives in Biology 3:a004614. The Journal of General Physiology 65:583–598. Biochemical and Biophysical Research Communications 111:567–573. Thank you for submitting your article "Phospholipase D activity couples plasma membrane endocytosis with retromer dependent recycling" for consideration by eLife. Your article has been reviewed by two peer reviewers, and the evaluation has been overseen by Randy Schekman as the Reviewing and Senior Editor. The following individual involved in review of your submission has agreed to reveal his identity: Vytas Bankaitis (Reviewer #2). In this paper Thakur et al. describe a role for phospholipase D (PLD) in regulating membrane turnover in Drosophila photoreceptor neurons. The paper makes a solid argument that re-cycling of rhodopsin relies upon a retromer-dependent, PLD-dependent mechanism. Here phosphatidic acid generated by light-activated PLD (via a pathway independent of trimeric G protein activation) is proposed to activate Arf1 and this in turn regulates recycling of the rhodopsin back to the rhabdomere membrane. The significance of this work is that it provides the first confident description of a PLD phenotype in a multicellular eukaryote and in a quantifiable and powerful system of intense lipid signaling. The work is generally thorough, well-controlled and brings new perspective to a field of lipid signaling that badly needs it. 1) The genetics would clearly be strengthened by an additional allele or two of PLD and, most importantly, the authors must show that PLD is a null, a significant concern given the molecular nature of the mutation. Minimally this can be done by comparing the effects of homozygotes to one in which dPLD3.1 mutation is placed in trans to a deletion removing the gene. 2) The approaches taken are powerful and the conclusions are generally well-supported. What is missing, however, is a demonstration of what component is PA-activated. This is an important issue as roles for PLD in regulating endosomal trafficking and membrane biogenesis have been demonstrated in yeast. Although the authors devote considerable discussion to the issue, they should address it experimentally. garz seems a likely candidate. It should not be necessary to conduct a full characterization of target but it would be worthwhile for the authors to at least assess whether garz, any fly retromer components, or fly ARF itself bind PA. there are already clues that mammalian ARF binds PA so a likely candidate is already known. 3) The genetic epistasis data argue PLD activates Arf and not the other way around (as dogma has long held). This point should be emphasized and it reinforces the importance of defining the target of regulation by PA as outlined in (a). 4) Have the authors conducted a stimulation train where they compare response run-down in wt vs. pld retina? They report a single burst ERG, but the run-down would be a more informative experiment. 5) The fact that several independent means for elevating PA result in suppression of pld defects argues that PLD protein::protein interactions are not functionally important. The authors should emphasize this point more forcefully as there is a large literature on the PLD interactome with much speculation on what it might mean. 6. In the subsection “dPLD activity supports RLV removal from the cell body during illumination”, last paragraph, first sentence – please provide the reference. Thank you for resubmitting your work entitled "Phospholipase D activity couples plasma membrane endocytosis with retromer dependent recycling" for further consideration at eLife. Your revised article has been favorably evaluated by Randy Schekman as the Senior and Reviewing Editor, and two reviewers. Your manuscript has been improved but the reviewers feel that a bit more work is needed to justify your conclusions. The Spo20 control experiment shows that the liposome binding of this protein is specific to PA (as is expected) and that it is concentration-dependent. However, you should examine dARF binding over the same range of concentration of PtdOH rather than showing one concentration in one Figure panel (8D) and another in the supplemental data. In addition, you should include a PtdSer control as well. Although one reviewer felt that the PtdOH binding data being omitted, the consensus was that you should perform the additional experiment as suggested above. This should be straightforward and it would lend biochemical support to your strong genetic/biological data. The response to my concerns about the genetics and additional alleles is satisfactory. I am skeptical about the biochemistry showing binding of Arf1 to PA. Several issues concern me: 1) The binding is weak, as they indicate; 2) the experiments are not well described; and 3) the discrepancy between the behavior of Spo2 (positive control) binding at different ratios of POPC/PA and Arf1 vs POPC/PA are problematic. The binding of at 70:30 is optimal for Spo2 and at 90:10 the binding is weak. The data in Figure 8D shows binding at 90:10. What was the binding at different concentrations? I will leave it to the lipid biochemists to give it their expert evaluation but I am skeptical of the data. It looks too different from the positive control to be compelling. I would prefer the authors leave the issue of the protein binding to PA unresolved than presenting data of this quality. The authors have done a reasonable job in positively addressing the comments raised in the initial review. They have revised the text of the manuscript to better highlight what this reviewer considers to be outstanding points made by the data. While it would have been ideal to pin-point a clear target for PLD-generated PtdOH in regulating Arf or the retromer complex, the likelihood of multiple targets does make this potentially an unattainable result in the time frame allotted. The fact that Arf does bind PtdOH provides biochemistry that is at least consistent with the pathway laid out by the genetics. In summary, this is an important paper and I am satisfied with the revisions made. We studied the effect of dPLD3.3, an independently isolated allele of dPLD that was also generated by homologous recombination; its molecular nature at the dPLD locus is identical to that of dPLD3.1 A trans-heterozygote combination of dPLD3.1/dPLD3.3 was compared to dPLD3.1/dPLD3.1. The light-dependent retinal degeneration phenotype of these two genotypes was compared. The severity and time course of retinal degeneration was found to be similar in both genotypes. This data is presented in Figure 3—figure suplement 1A,B. We also studied the phenotype of dPLD3.1/dPLD3.1 in comparison with dPLD3.1/Df (2R)ED1612. Df (2R) ED1612 is a Drosdel deletion of the region of the dPLD gene and removes the full sequence of dPLD (Figure 2—figure supplement 1B). dPLD3.1/Df (2R)ED1612 also shows light-dependent retinal degeneration over a similar time course to dPLD3.1/dPLD3.1. Importantly, the severity of degeneration in dPLD3.1/Df (2R)ED1612 was not greater than in dPLD3.1/dPLD3.1 (Figure 3—figure supplement 1C) providing additional support that dPLD3.1 is a null allele. The slightly slower rate of degeneration in dPLD3.1/Df (2R)ED1612 is likely due to the reason that Df (2R)ED1612, removes, in addition to dPLD, 115 other genes one or more of which may have a modifier effect on the dPLD phenotype. We agree that the molecular mechanism by which PA exerts its effects is an important issue. However, it is also a challenging one given that there are dozens of proteins that have been shown to bind PA in vitro. In the context of the present study, Arf1, garz and retromer components are plausible protein targets to which PA might bind and exert its effects. Given the large number of proteins in the retromer complex it was difficult to decide on which ones to study. However we performed in vitro liposome based binding assays to test PA binding to endogenous Drosophila Arf1 and GARZ. We could not demonstrate binding of garz to PA containing liposomes (Figure 8—figure supplement 1C). However, we were able to demonstrate weak binding of endogenous Drosophila Arf1 to PA containing liposomes (Figure 8D). The ability of Arf1 to bind to PA containing liposomes was weak in comparison to that of the well-known PA binding protein Spo20. Up to 30% PA was required to show good binding of Arf1 to PA containing liposomes. Together with our finding that the biological effects of expressing Arf1CA on photoreceptors required intact dPLD function (Figure 8C), the in vitro binding assay suggests that Arf1 is a likely protein target of PA produced by PLD. This has been reinforced in the Discussion. We have now included two additional physiological protocols (i) Photoreceptors were exposed to a continuous 10 s flash of light to check for any run down/loss of response. This was not seen; the raw traces and quantified data is now included as Figure 2—figure supplement 3A, B. (ii) We also stimulated photoreceptors with a train of rapid flashes at the high light intensity. Once again there was no difference between the response of dPLD3.1 and controls; both continued to respond in an equivalent way with no loss of electrical response. Representative traces and quantification are now included as Figure 2—figure supplement 3C, D.
We have attended to this in the text. The relevant reference Chinchore et al., 2009 has been added. This work was supported by the National Centre for Biological Sciences-TIFR, the Biotechnology and Biological Sciences Research Council, UK, Department of Biotechnology, Government of India and a Wellcome Trust-DBT India Alliance Senior Fellowship to PR. We thank the NCBS- Max Planck Lipid center, Electron Microscopy, Imaging (CIFF) and Fly Facility for assistance. We thank Hanneke Okkenhaug for assistance at an early stage of this project. We acknowledge the generous support of numerous colleagues who provided us with fly stocks and antibodies. © 2016, Thakur et al.